The voice of the gnats. 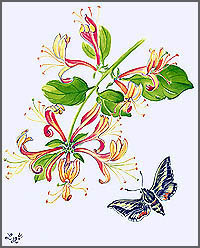 blooms from early summer to autumn and, like honeysuckles around the world, can be found twining through light woodlands and hedgerows or perfuming a trellis in the garden. Although its blooms are simple and short-lived, honeysuckle is a magical flower of the night, opening its pale silvery buds at dusk. The silvery color and delicious perfume are designed to attract moths, which pollinate the flowers as they sip nectar from the base of the blooms. However, daytime bees will occasionally nip a small hole in the tube and "steal" the nectar without brushing past the pollen! Another Japanese name for honeysuckle is kinginbana, meaning "gold-and-silver flower," as the blooms turn from silvery white to pale gold. Gardeners also like the western honeysuckle (L. sempervirens), which has clusters of colorful pink buds that open to pale yellow. 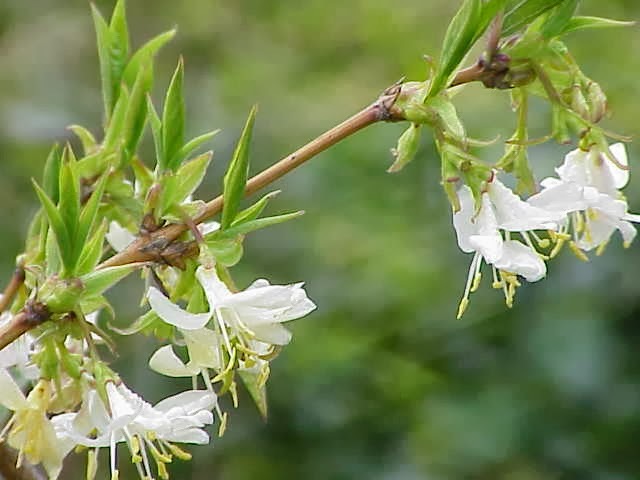 In Japanese this species is called tsukinukinindo, meaning "pierced honeysuckle," because the stem appears to pierce through its clasping leaves. I found the honeysuckle above growing in a cascade of flowers in an English hedgerow, and even after keeping the sprigs in a vase for a week, new buds were still opening and sending out an exquisite perfume, especially at night. 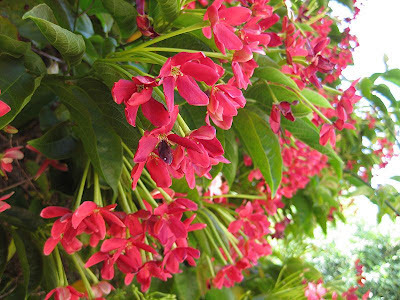 Chinese honeysuckle, Rangoon Creeper, and Combretum indicum is a vine with red flower clusters and is found in Asia. It is found in many other parts of the world either as a cultivated ornamental or run wild. Other names for the plant include Quiscual (in Spanish), Niyog-niyogan (in Filipino), Madhu Malti or Madhumalti (in Hindi), Akar Dani (in Malay) and Radha Manoharam (in Telugu). The genus translates into Latin for What is that?. is pollinated by bees by day and at night the moths are attracted by the wonderful scent, the Elephant Hawkmoth regularly visiting in search of nectar. This is a native plant belonging to the family Caprifoliaceae. winter honeysuckle, fragrant honeysuckle, January jasmine, and sweet breath of spring. It is native to China and has been an introduced species to other parts of the world. Plants named UTSUGI (utsuki) ウツギ "blossoms in the sky"
to relax in the evening and sleep well. 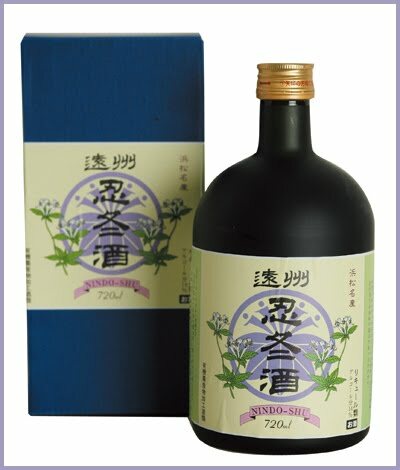 In the Edo period, the production of this wine was only taught from father to son, it was a top secret family tradition. The base is a sweet mirin from mikan mandarins of Mikawa, Aichi prefecture. 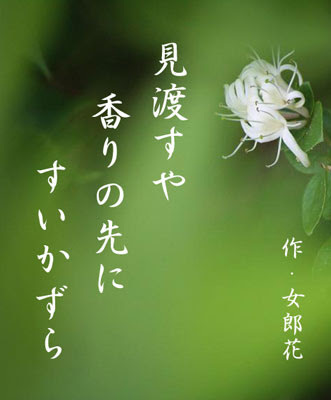 "The nindou is not a very striking flower, white, and afterwards becoming yellowish. It does not fade in winter, and from this comes its name, "enduring winter."" "Of all sounds, the voice of the mosquito is the most mysterious, of deeply subtle meaning. Of all flowers, the whitish-yellow 'nindou' is the most forlorn. Each time the voice of the gnats is noticed, the flowers become more remotely near. Each time a flower falls, the sound of the gnats is more profound in the heart." "The 'nindou' is not a very striking flower... The voice of the mosquito also is very small indeed, not to be heard far away from the ear. We have in this verse two hardly noticeable things, yet they and their chance relationship are clearly perceived and expressed."
. The voice of an animal . ***** . Nintoo Ki 忍冬忌 Ninto Memorial Day .